ART DECO ARCHITECTURE and ART DECO INTERIORS featured on other pages) gives us a new way of looking at these miniature works of art. 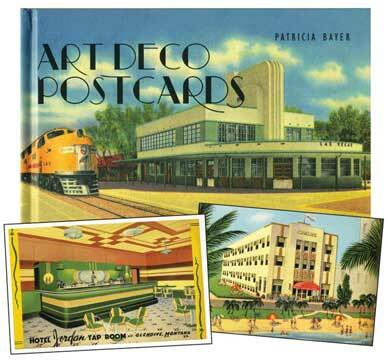 Featuring 264 postcards from the 1920’s to the 1940’s, the subjects range from the iconic skyscrapers and nightclubs, to hotels, restaurants, exposition structures and other notable buildings. the book includes a set of 8 great detachable and useable facsimile postcards. 288 pages, HC, 8-1/2” X 5-1/2”.